I love my bike. It’s one of those city-cruiser bikes, based on the Amsterdam design with high handle bars so I can sit up straight; three gears so I can cruise up small hills; a comfortable leather seat that I am sure was designed and tested by women, and a yellow flower and basket. People I pass have palpable bike-envy. Not a day goes by that I don’t get asked where I got my bike and could someone have a turn. I love my bike. But recently I have been enjoying riding my lovely bike around for a whole other reason. It has become clear to me that bike-riding is a wonderful metaphor for meditating…an unlikely one…but the more I ride and think about it, the more I can see it. When embarking on a meditation journey – be mindful of your point of fixation. When learning meditation and particularly practicing the mind concentration techniques to move into a meditative state many students find themselves fixated on not letting their mind wonder. The inner fixation of “I must not let my mind wander! I must not let my mind wander!” becomes a self-fulfilling prophecy. When riding a bike through narrow posts, if we lift our point of fixation up and through the posts, rather than at the posts themselves, then we glide on through the perfect centre. Similarly, when learning to concentrate the mind, if we lift the point of fixation up and beyond the narrow posts of ‘ not letting the mind wander’, to ‘I am entering meditation’, the storm of the mind will naturally become calmer. Meditation is a spontaneous state that arises when we create the right environment internally for it to do so. When we set our intention to allow meditation to establish itself within us, then catching and drawing back the mind becomes part of the process towards it, not a battle. If we set out gaze on the path ahead there is a natural alignment of mind, body, energy and breath to get us there. This is not to say it doesn’t take practice, and particularly regular practice, it does, but just like learning to ride a bike, as soon as you have ‘the feel for it’, your system will gather itself and align to allow a glide through to the perfect centre. You move relatively quickly beyond the initial stages of calming the system and concentrating the mind into true meditation. 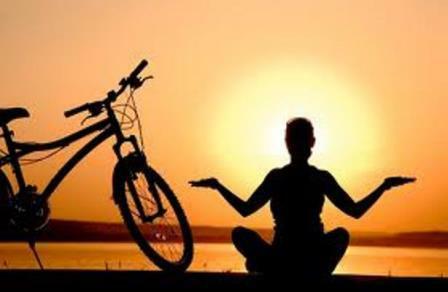 When embarking on a meditation journey – be mindful of how tightly you are holding onto the handlebars. Lots of students when they are starting out on the meditation journey are very attached to an outcome. It’s not really the outcome itself that can create the problem; it’s the level of attachment to it. Often the desired outcomes are worthy and noble – greater presence in daily life, a calmer happier disposition, a greater understanding of self and life-purpose for example. But when we are so strongly attached to these outcomes we can lose the playful openness required to enter meditation fully. We also open ourselves up to comparing our meditation journey to other’s journeys. Both contract the energies involved and limit our experience of it. Remember that feeling of freedom and flow when you were little and had mastered riding your bike? When you are present to the wind in your hair, on your skin, the sense of speed, the mystery of the road ahead. (Even if it was just the neighbourhood back alley…oh… it promised such adventure!) I still get that feeling when I ride my bike – I think perhaps that’s why I love it so much. It’s that moment when all the component actions click into one unified movement of flow and balance; when you stop thinking about the peddling, or the steering, or the gear changes, and your mind/body system operates the bike instinctively, allowing your senses to lift and take in the whole wonderful experience. There can’t be a better metaphor than this for meditation. There comes a point, when you let go of consideration of posture, breath and engineering a point of focus to concentrate the mind. You know the way. Your natural design takes over. You have created the path inwards by walking it regularly. It feels like going home. You move into an awareness and presence that is both very still and ultimately dynamic all at once. You feel perfectly balanced and have a palpable sensation of flow which becomes apparent in everyday life (beyond your meditation stool). And so many studies now show that abiding regularly in this state has marked affects on your brain function, emotional resilience and physical health. It’s just a matter of doing it! Once you have found the balance and flow and the track inwards…you never forget how to do it….just like riding a bike! Once you have found that track inwards and all the component actions click into a cohesive inner movement, you can pick it up again and quickly. You never forget the feeling of entering a meditative state. If life takes you away from your regular practice, you can pick it up again. Your bike/technique/concentration might be a little rusty, but you can ride! The more regularly you ride, the more easily you can trust the process and surrender to it fully. A well-kept bike makes for a smoother ride. My very gorgeous husband services my bike every weekend. He cleans the chains, pumps the tires and wipes down the frame. (I love him even more than my bike!). A well-kept bike always makes for a smoother ride with less resistance. Similarly a well-kept mind and body serves the meditator the same way. Maintaining a healthy diet, exercise, lots of hydration and sleep and not overtaxing the system, combined with inspirational content and company for the mind, makes for a much smoother ride into meditation with less resistance and much less internal stormy weather. So on your bikes then!